"These photos were submitted by Rick Harris of the Collings Foundation. 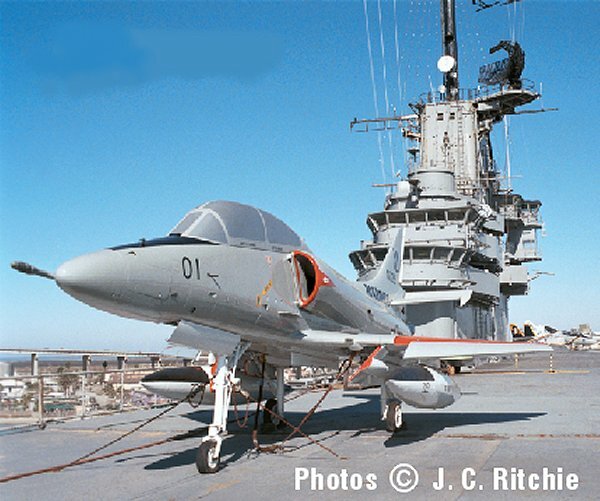 They were taken by and are from the collection of Jim Richie, who does the Skyhawk Association's Newsletter. Rick visits the Lex quite often with scout troop outings. 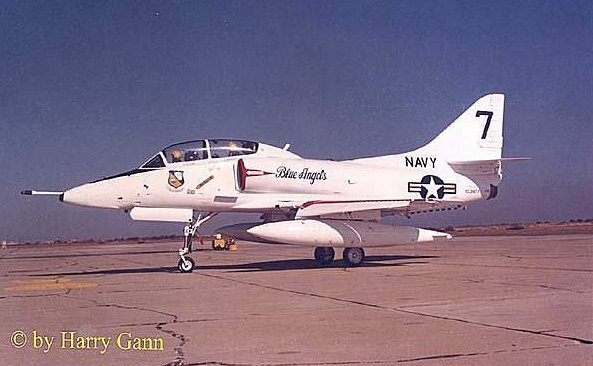 He said that his 12 year old son was the one who pointed out to him that this was a former Blue Angel Aircraft"
This is one of three TA-4J's that served with the Blue Angels. The BuNo of the others are158107 (in Angel colors) and 153477 which was on loan for the winter training of 1981. They called this one "Casper" because it was never painted blue. FROM: Lt. Col. Bill Campbell, USMC Ret. I saw the picture on the Web site and checked my Logbook. 158722 Was the main TA-4J of 2 used by the Team as number 7 in 1986 up until the complete transition to the F-18 in 1987. Most of my time as Blue Angel 8 in 1985 and 86 is in aircraft 722. 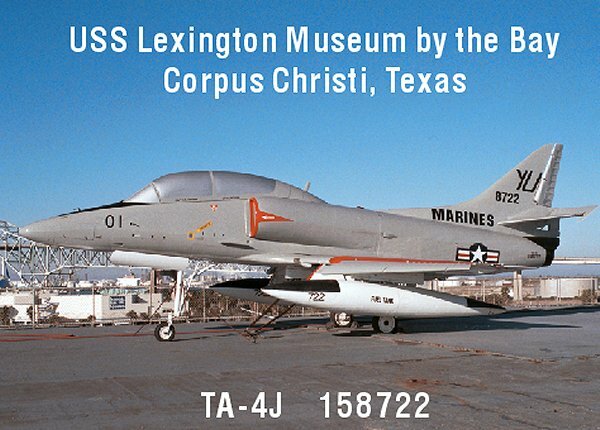 Note: The USS Lexington Museum is lucky enough to have two of the original Blue Angels Press airplanes. The TF9J (F9F-8T Cougar) and the TF-4J Skyhawk.